We make life better. We make life fun. (Grand Prairie, TX – September 11, 2015) Alliance Sports Group announced the launch of its newest IPROTEC firearm lights. The iPROTEC RM400LSG and RM190LSG – both feature a powerful LED bright white light and a green laser combo that attach to any rail–equipped firearm. These powerful lights are ideal for military, law enforcement, self-defense as well as general shooting enthusiasts. The RM400LSG offers a high-powered 400 lumen LED and a sightable green laser that travels over 450 meters. The light has four unique modes include high, medium, low and strobe. The RM400LSG has a patented adjustable hinge mount that attaches to rail-equipped firearms without any tools. The light can be operated by its standard end cap button or remotely via a dual-mode pressure switch. 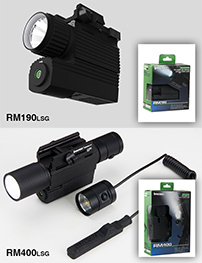 The RM190LSG features a high-powered LED that outputs 190 lumens of intense white light and a green laser that travels over 450 meters. Ideal for rail-equipped pistols and long guns, the RM190LSG offers two light modes including steady ON and a defensive strobe. The anodized aircraft-grade aluminum body is water and impact resistant. The patented adjustable hinge mount makes installation easy with no tools required. The iPROTEC RM400LSG and RM190LSG have begun shipping and are available in 4 piece case packs. The MSRP is $99.95 for the RM400LSG (#6271) and $89.95 for the RM190 LSG (#6270). Alliance Sports Group is a leading designer, manufacturer and distributor of innovative, high quality products that consumers love. The family of Alliance Sports Group brands include NEBO, iPROTEC, Bollinger Fitness, Quarrow, Solaire, WEATHERRITE and True Utility. Alliance Sports Group is a supplier to over 30,000 independent retail stores as well as the nation’s largest retail chains. Alliance Sports Group is a leading designer, manufacturer and distributor of innovative, high quality products that consumers love. The family of ASG brands include NEBO, Bollinger, Quarrow, Solaire, WEATHERRITE, iPROTEC and TRUE UTILITY. Copyright Alliance Sports Group 2015, All rights reserved.